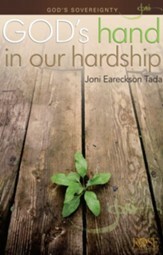 Joni Eareckson Tada offers hope to people struggling with health and emotional challenges. After a 1967 diving accident left Joni Eareckson Tada a spinal cord-injured quadriplegic, she embarked on a lifelong study to make sense of suffering from God's perspective. Joni Eareckson Tada is now an international advocate for individuals with disabilities, and the founder of the non-profit organization, Joni & Friends. It is hard to be grateful when you are looking into the jaws of mind-bending pain. Chronic illness, a heart attack, a terrible car accident, caring for a developmentally disabled child, facing betrayal and loneliness... these kind of tough times make you want to give up and throw in the towel. You try to overcome, but the exhaustion destroys your energy and hope. You try to pray, but the pain interrupts your concentration. The topics of fear and hopelessness, depression and suffering, loneliness and worry are issues that author, Joni Eareckson Tada, can speak to personally: A diving accident when she was 17 left her a quadriplegic. She has lived 45 years in a wheelchair and has experienced her share of ups and downs. "But," she says, "oh, the difference the grace of God has made in my life." 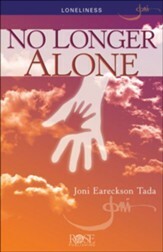 Let Joni tell you her secrets to peace and joy, despite her wheelchair. She has taken her most important insights on thankfulness and joy and encapsulated them into this 14-page pamphlet. Whether you or a loved one is suffering. This pamphlet will bring you comfort. Glossy, full-color panels unfold to 38 in. Fits inside most Bibles; 8.5 x 5.5 in. 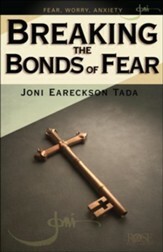 Learn from Joni Earekson Tada the causes and antidotes to fear, worry and anxiety that she learned from Scripture and Jesus' teachings. 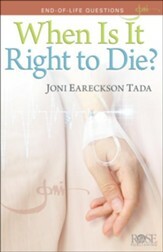 Joni shares experiences from her own life both before and after the tragic diving accident that caused her quadriplegia, and explains how even death is not something to fear when our trust rests in the One who conquered death. Find freedom from your fears and the peace which transcends all understanding. 14 full-color, laminated panels, 8.5 x 5. 5 inches, which unfold to 38 inches. Uses NIV. Fits in most Bibles. From forgotten medication to forgotten faces, memory loss can be incredibly painful for the family members of the sufferer. Our most valued relationships are built off fond memories, but when these memories start to fade, it's important to have support from others. Your help and encouragement can make a difference! Get equipped with biblical wisdom and practical, time-tested advice from Joni Eareckson Tada and gain the confidence to be there for your loved one when they begin experiencing memory loss, Alzheimer's, Huntington's disease, or any other form of dementia. Grief comes in all shapes and sizes, sometimes arriving suddenly. It could come in the form of a life-changing diagnosis or injury, a bitter divorce, the death of a loved one, a devastating job loss, or the anguish of caring for a child or parent with chronic pain. 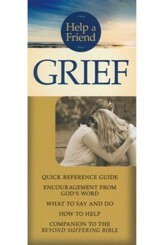 Help a Friend: Grief equips you with biblical wisdom and practical, time-tested advice from Joni Eareckson Tada and gain the confidence to be there for your friend or relative when they need you most. 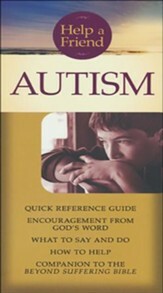 Joni Eareckson Tada's concise guide to helping families affected by autism spectrum disorder is packed with easy-to-read information, practical tips, and Scriptures at your fingertips! The 20-page Help a Friend: Autism pamphlet will help you provide practical support and help to families affected by autism and dispel common myths about people with autism spectrum disorder. Disability can come in all shapes and sizes, so what can you say or do to support a friend that is newly affected by disability? What can you say to someone you care about who must adjust to a new way of life due to an uncontrollable condition? 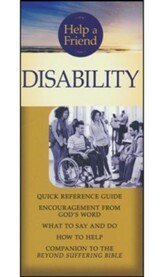 Help a Friend: Disability equips you with biblical wisdom and practical, time-tested advice from Joni Eareckson Tada and gain the confidence to be there for your friend or relative when they need you most. When you read through the Bible, you can see that God hates suffering. Jesus spent much of his life relieving people's illnesses and hurts. He calls us to do the same: to feed the hungry, clothe the poor, take care of widows and orphans and visit those in prison. So why doesn't our all-powerful God get rid of suffering? 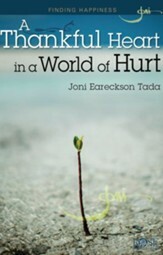 Popular author and speaker Joni Earechson Tada has spent most of her life studying and helping people make sense of suffering from God's perspective. 8.5 x 5.5 inch pamphlet fits inside most Bibles. Full-color, glossy panels, unfolds to 38 inches. Are you or someone you love experiencing great suffering in loneliness? Do you long for intimate friendships? Joni Eareckson Tada weaves in a true story about a woman who was devastated by loneliness with how she sought God in her pain. There is hope for those who find themselves in a "desert of solitude". Jesus understands our pain because he endured a great amount of loneliness when he was on the cross. 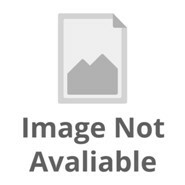 14 full-color glossy panels, 8.5 x 5.5; fits inside most Bibles. 14 full color, glossy plasti-coated pages, 8.5 x 5.5 inches, fits inside most Bible covers.